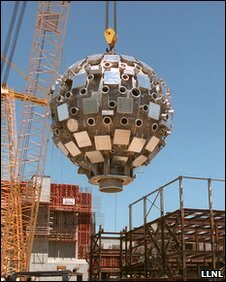 Construction of the National Ignition Facility began at Lawrence Livermore National Laboratory in 1997, and was formally completed in May 2009. 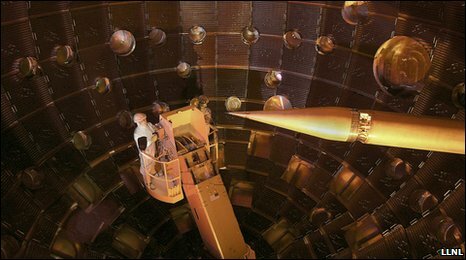 The goal, as its name implies, is to harness the power of the largest laser ever built to start "ignition" - effectively a carefully controlled thermonuclear explosion. It is markedly different from current nuclear power, which operates through splitting atoms - fission - rather than squashing them together in fusion. 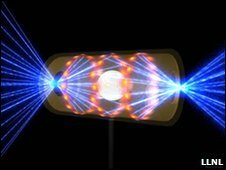 Proving that such a lab-based fusion reaction can release more energy than is required to start it - rising above the so-called breakeven point - could herald a new era in large-scale energy production. During 30 years of the laser fusion debate, one significant potential hurdle to the process has been the "plasma" that the lasers will create in the hohlraum. By way of comparison, if that power could be maintained, it would boil the contents of more than 50 Olympic-sized swimming pools in a second. "For the first time ever in the 50-year journey of laser fusion, these laser-plasma interactions have been shown to be less of a problem than predicted, not more," said Mike Dunne, director of the UK's Central Laser Facility and leader of the European laser fusion effort known as HiPER. "I can't overstate how dramatic a step that is," he told BBC News. "Many people a year ago were saying the project would be dead by now." Adding momentum to the ignition quest, Lawrence Livermore National Laboratory announced on Wednesday that, since the Science results were first obtained, the pulse energy record had been smashed again. They now report an energy of one megajoule on target - 50% higher than the amount reported in Science. Dr Glenzer said that experiments using slightly larger hohlraums with fusion-ready fuel pellets - including a mix of the hydrogen isotopes deuterium as well as tritium - should begin before May, slowly ramping up to the 1.2 megajoule mark. "The bottom line is that we can extrapolate those data to the experiments we are planning this year and the results show that we will be able to drive the capsule towards ignition," said Dr Glenzer. He added, quite simply, "It's going to happen this year."